During December 4-17 in 2016, the Thirteenth meeting of the Conference of the Parties to the Convention on Biological Diversity (COP 13: official website, the host country's special website) will be held in Cancun, Mexico. To participate in it, we set this year's project theme as biodiversity. Biodiversity conservation is one of the two biggest environmental problems at global scale as well as climate change. The Aichi Biodiversity Targets, which was adopted at COP 10 in 2010, set to "Address the underlying causes of biodiversity loss by mainstreaming biodiversity across government and society" as our first strategic goal. Because we, the students of the OBHP, take the need for this, we plan to hold a side event titled "Mainstreaming Biodiversity by Big History" at COP 13. Big History is a project that every person of 7 billion humans creates innovations to resolve global issues from cosmic and global perspective. How should we apply Big History to biodiversity problems? Through Cancun Mission, we want to convey all of your "collective knowledge" to the world at the international conference. Please let us listen to your creative ideas. On Decmeber 7, 2016 (local time), OBHP and Japan Civil Network for the United Nations Decade on Biodiversity jointly held a side-event titled "Mainstreaming Biodiversity utilizing 'Big History'" at the Communication, Education and Public Awareness (CEPA) fair for the Thirteenth Conference of the Parties to the Convention on Biological Diversity (CBD COP13) in Cancun, Mexico. "Big History as an Environmental Education Program"
"Biophilosophy and Big History: Zootopia and Kinji Imanishi"
"Sustainability of the 200-year-old Companies"
Dec. 3, 2017 We published the final edition of the position paper. You can download the button above. 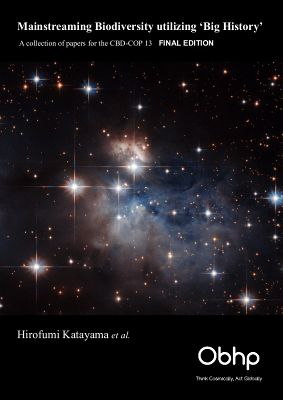 Hirofumi Katayama et al. 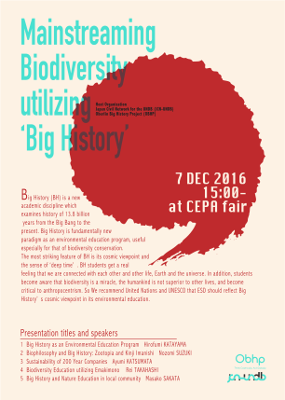 (2017) Mainstreaming Biodiversity utilizing 'Big History': A collection of papers for the CBD-COP13, final edition, Tokyo: Oberlin Big History Project. Mar. 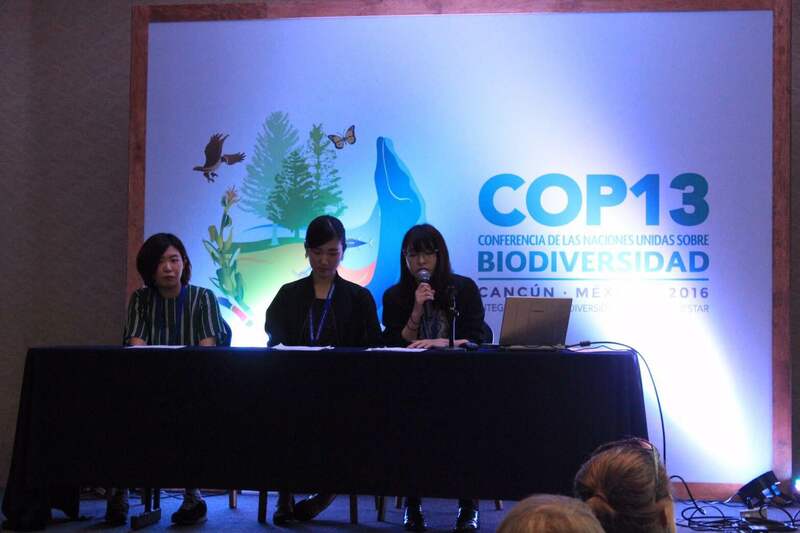 25, 2017 The Japan Civil Network for the United Nations Decade on Biodiversity's report of the COP13 includes the very short essays on our visit to Mexico written by Katayama, Suzuki and Tsujimura. Sakata, Masako and Yasuaki Miyamoto eds. (2017) The Japan Civil Network for the United Nations Decade on Biodiversity's Report on the Thirteenth Conference of the Parties to the Convention on Biological Diversity, Tokyo: Japan Civil Network for the United Nations Decade on Biodiversity (Japanese publication). Mar. 11, 2017 The Japan Civil Network for the United Nations Decade on Biodiversity's website reported our Cancun Mission. Jan. 5, 2017 Katayama and his students spoke about thier visit to Mexico on FM Sagami's radio show, "Go Eco Sagamihara." Dec. 21, 2016 The J.F. Oberlin University's website reported our Cancun Mission.